A couple of weeks back I shared with you the fun alphabet wall decals I used in Baby Girls nursery. 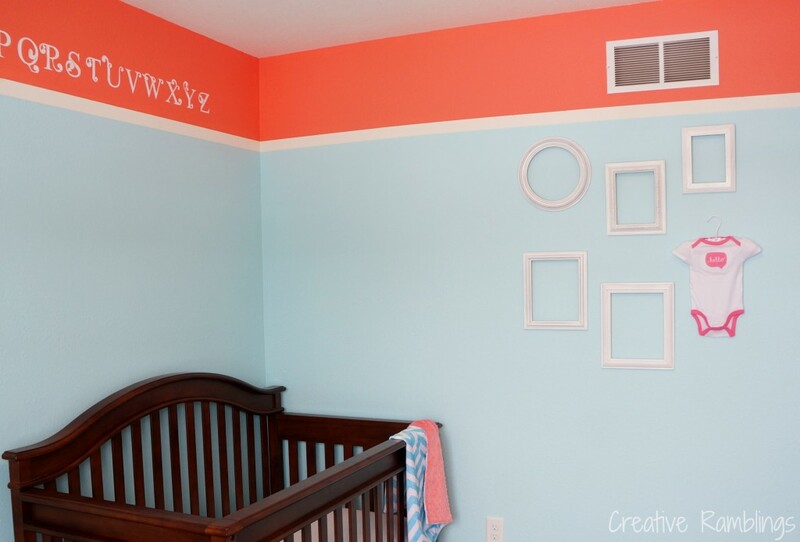 This week I am sharing with you the other walls and decor in her room. First up a gallery wall. This was a blank wall staring at me needing something. I wanted artwork, maybe painted canvas or baby pictures or pictures of family members as babies. I just couldn’t decide. Finally I settled on empty frames. I saved all the insides so I can add prints or pictures down the road, but for now I really like them the way they are. I picked these frames up at a couple of my favorite thrift stores and spray painted them white. I didn’t completely cover them so without any distressing they have a slight antique look. I received this onesie as a gift and thought it was just adorable. At some point i will probably switch it out so Baby Girl can wear it, but until then it works perfectly with this collection of frames. What do you think, do you like the empty frames? If I fill them what should I fill them with? Like this post? I would love for you to share it on Pinterest. Visit Sarah Vanderkooy’s profile on Pinterest. I have my husband making thick/wide reclaimed barn wood frames for a hallway. Oh that sounds so pretty, I love reclaimed wood. I love empty frames, so I say keep them empty. Thanks Cari, I am loving the empty look too. I love, love, love the empty frames and the little hello onesie just puts it over the top. 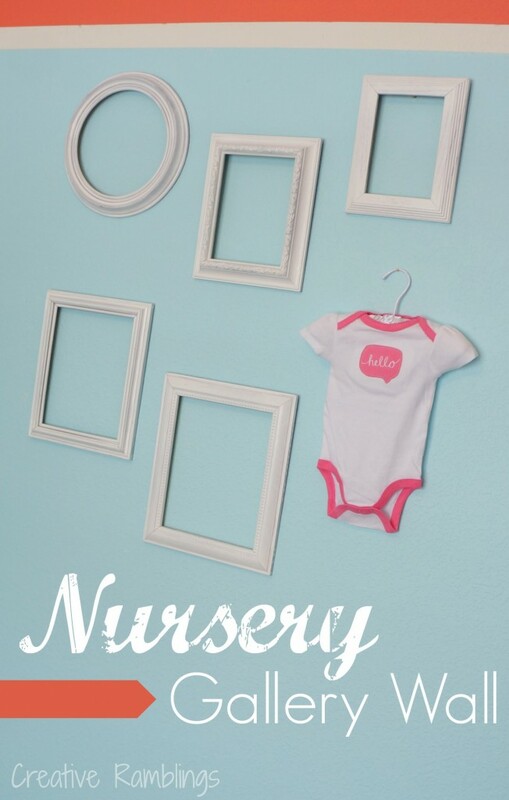 I just adore out-of-the-box decor and your nursery rocks! Thanks Alli, you are too sweet! 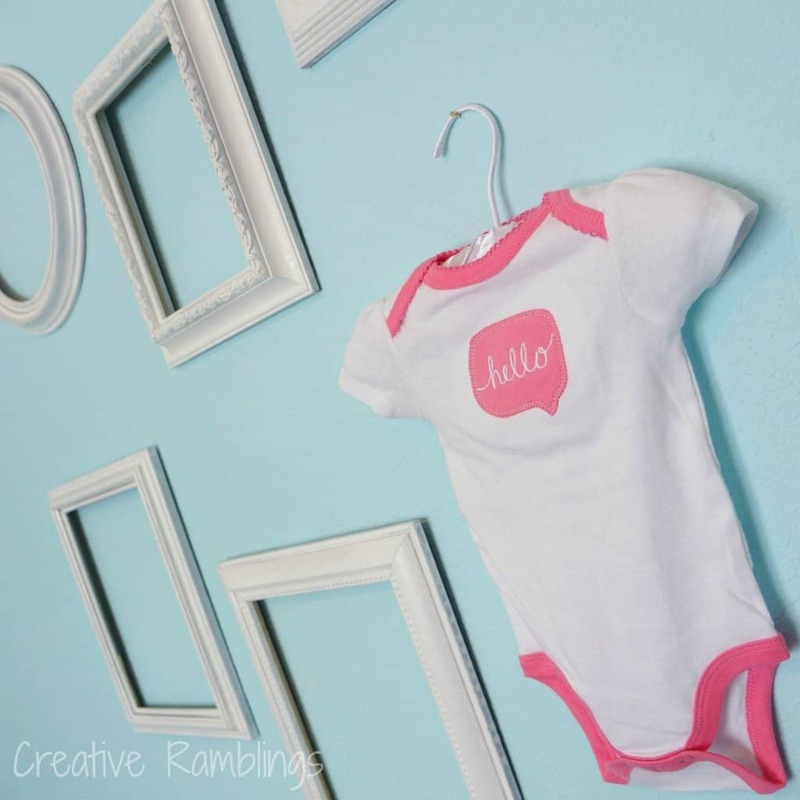 That little “hello” onesie is adorable. I love painting over old frames to make them look fresh and new! If you haven’t already, I’d love for you to link up at Link’n Blogs. Thanks! Thanks Daniela, I’ll hop over to your party today. I love the top being a different color and love the empty frames. I would paint one of them orange to tye into the top…Adorable! Thanks for sharing at The Weekend Retreat, Hope to see you back next week! This turned out so cute! I love the onesie added to the frames!! Thank you so much Meredith.